Interesting picture, but come on, it was taken in the springtime. It’s SUPPOSED to warm up! Sorry, but I’m one of those HUMBUG guys when it comes to the whole global warming thing. There are way too many contrasting arguments by people who are a lot smarter than those of us who have the time to watch this website. Nice pic, but please don’t start using your site as some kind of socio-political springboard. Stay pure Vurdlak, and keep up the good work. Well, it’s his website, and I really think that means he should post what he pleases here. If you’re offended by comments about global warming, then just move on- don’t use someone else’s comment section for a sociopolitical springboard. Very interesting pic…I agree about the lips, though- she needs some chap stick really bad. It looks more like it’s getting colder! looks more like a bad case of a runny nose! “We are beating up mother earth” LOL! It makes “Mother Earth” cry when people try to push politics and say that science supports them. I’m not blaming this site, but whoever photoshopped that picture. C’mon, there has been localized warming around monitoring stations, but globally, there hasn’t been any change over the last few decades. Jim, don’t be so narrow-minded. It’s a glacier, it doesn’t melt just because it’s spring. And seriously, “too many contrasting arguments”? I’ve yet to see a convincing argument that says global warming isn’t real. Doesn’t matter if you’re not smart, you just have to face the honest facts, not that made-up crap that some people try to shove down your throat. In any case, the “illusion” looks good. I’d really rather call it an intriguing coincidence, though, lol. Dude, in case you don’t know your science, it doesn’t take much of a temperature difference to mess up the whole planet. A couple of degrees would do it, especially in the right places. Saying that is about as stupid as saying that a degree’s difference in body temperature isn’t a fever, lolz. Oh, yeah, just realized how narrow-mindedly stupid Tim’s “localized warming around monitoring stations” comment really is, haha. Dude, monitoring stations are made to monitor the temperature, so if they show an increase, then there’s definitely an increase. How do you expect to know about changes in temperatures in areas not being monitored? Of course only the monitored places will show increases, because they’re being monitored. Man, people and their stupid arguments fueled by blind so-called “facts”. Try some real thinking using real facts, how about it? Not that crap some people (thankfully, a minority of people) try to sell you. Vince, you speak as if you know science … why don’t you share then when the last time the earth was this hot, and who/what might have caused it. Stick comments to the illusion, or lack there of. Also, you should make yourself aware of the fact that global temperatures peaked in 1997 and have dropped since then. As to the comment in your second post: really? A 1 degree temperature difference means a fever? Normal hour-to-hour differences in a day can yield a 1 degree swing. Being outside on a hot day, exertion, eating spicy food, can easily raise body temps by a degree or more. Way I see it, my memory is proof on the state of the environment. I remember as a kid going out for halloween, and trick or treating when there was snow on the ground. Now, sometimes we don’t get snow until mid december. That’s significant. anyhow I love the pic, who knew mother nature was a fan of Picasso? Anyways, yeah, global warming is inevitable. Any one remember back in the 70’s? Exact same things happening.. to much auto exhaust.. to much “mankinds” effects on “mother earth” is leading the world to a…. SECOND ICE AGE!!! It is all just cycles, happened before, will happen again, and man can NOT make a single change to it by our daily living. Mother Earth is one tough lady — has been for eons. She laughs. She cries (though not from the side of her head). Most of all, she is rarely gentile. In addition to learning some hard science, Vince should learn some geological history. Mother Nature has been warming and cooling this little rock we call Earth all without the help of the human experiment for hundreds of millions of years. Human caused global warming is the biggest scam in recorded history. Where I disagree with Jim and Tim is that such rhetoric certainly does belong on a site like this as human caused global warming is an illusion! There is no science that supports the argument. Before anyone starts spouting the “consensus” of experts, science doesn’t advance understanding based on consensus. Understanding in science only advances with verifiable and replicable study. I would have thought that the ‘illusion’ of human caused global warming would be transparent on a site dedicated to illusions. JIM – What? Are you denying global warming? Oh come on! It’s a picture with a caption, and it’s the picture we’re looking at. So cool the political comments. The picture is great by the way. Thats just it. I have herd very compelling arguments on both sides and each make is seem like they are right. No one cannot admit that global warming is a billion dollar industry. Money is a huge driving force. I believe in the 70’s it was global warming and the 80’s was the scare of global cooling. Now its global warming, or “climate change”. There are so many factors out there not only in the earth, but forces beyond the earth that cannot be accurately tested, no matter what super computer you use. I do say we need to take care of the earth, and sure it could be warming up, but to be so pampas as to say we humans are the cause of it is a little much. I was gonna keep my mouth shut but to Jim and Tim, do your history this if it is a warming will be our 4th one ans as far a s a small temp drop ya i will affect something oh say in 2 or 3 decades and to the CO2 yakers no i will not stop using my pain ball gun. ya global warming and like a movie it is nothing but a greedy remake. my god all the people that would be out of work so do me me a favro and shut up and enjoy the web site and let your grandkids deal with it as in our life time we are not gonna see a major shift. This has nothing to do with global warming. Ice Caps are supposed to melt at certain times of the year. Mother Earth. Father Time. Who cares? They’re all out to get us. I LOVE it! Its pretty creepy tho. Almost reminds me of the Exorcist! I would like to point out that even if global warming is false, reducing our relience on fossil fuels is a good thing. Just saying. I believe in this hole global warming thing but not to the extent that the scientist are trying to make out it is, cause palaeontology has proven that Earth has alway had periods of global warming and ice ages, and the world bounces from one to the other. I believe the Earth is at fault not man, for earth is on a roughly 25 degree angle, and takes about 25.000 years to revolve in its axis (so say the astrologist). so my theory is when the north pole looks directly away from the sun in summer (the wormer time of the year)the north suffers an ice age and when it faces towards the sun, we suffer form a global worming, cause if you think of it the last ice age was roughly 12.000 years now, so that means to me that during the last ice age the north pole faced away from the sun but now its facing towards it, eventually the north pole will look away again causing a new ice age. 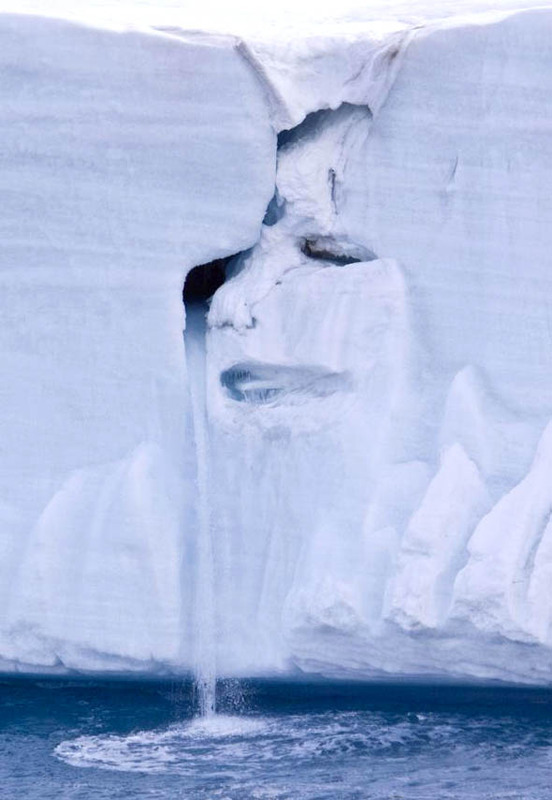 oh and its a nice illusion you can really see the face in the ice shelf crying. However if you bothered to read the whole BBBC link you pasted onto your comment, you will find its PRO global warming. Maybe a life lesson you should heed? Read and understand any links your including. Anyhow the Picture is designed to get people thinking about global warming. Very successful judging from all the above comments. @Craig – You just “comment” but you don’t have anything to say either. Obviously the biggest recorded climate changes have been lowering temperatures (hundreds of years ago), so global warming is fairly new, which means something is causing it. @Astro – you obviously do not know what you are talking about. The average human temperature is around 37-37.5 degrees, if it hits 38.5, then that is a fever. And i said change, not fluctuation. Duh! And “spring thaw” happens in the mainlands, not on glaciers. Since spring is seasonal, of course it heats up faster. It’s after winter, and winter, in case you don’t know, is freaking cold. In any case, glaciers never melt that fast. Not in spring, not in summer. And for those who want to bring politics into the discussion, shows what kind of brains you keep. b. have the slightest ability to keep the earth at that temperature. The earth may be getting warmer – or colder – but man has had and will have little to do with these fluctuations. They’ve been going on for tens of thousands of years, and will continue to do so. MIT students debunking global warming. So yea, there are a lot of evidence disproving the idea of global warming. What if it was a human-made problem, but not by CO2 emissions.I say we should investigate chem trails that a multiple of planes spray weekly over our skies in which we inhale. Could it possibly be the government’s attempt to control weather by using chemicals? Oh, all of you just shut your silly yaps! If you can’t even spell or punctuate a simple sentence, how can you expect anyone to accept your pompous pronouncements about whether or not there exists “any science” supporting one view or another? You may or may not accept that humans have had any effect on their environment, but too many people use that as an excuse to waste resources such as water, trees or fuels. Look at the picture. If you think it’s an interesting one, just say to yourself, “Hm. That’s an interesting picture caught at an opportune moment.” If not, then just move on! I see Bison’s buttin head….. If I could I would stop global warming right now. Mother earth diservs to cry. The envirement is becoming more and more thretened by global warming. I want me, my children and their grandchildren to have a future. Some people just don’e realise that kids aren’t going to have a future if they don’t stop global warming. I really would love to post this allover the enternet and see how much people would listen to me. I would love to post this in every website in the world. If you are reading this I would like you to know that our days are numberd and so are the world’s. Please go green and remenber it is for the good of the future! I will stay out of it. When I posted my original comment, I wanted to downplay the whole global warming debate. I did not want to create a forum for us (who incidentally come to this page for it’s OPTICAL ILLUSIONS) to beat each other up. If I wanted to do that, I would have pointed out that I believe this is GODS planet, and I believe he will take care of us as is His plan. I do not believe in Mother Earth, Father Time, Santa Claus, or the Easter bunny. I let go and let God. That being said, I say we leave the debates out, and let Vurdlak continue his OPTICAL ILLUSION theme please? I love the Website, but this looks photoshopped. Loved the pic! I think i will add my 2 cents now. I guess in my opinion you can not leave a running car in a greenhouse and have your plants servive for very long. We may not control everything that Mother Nature does to the Earth but we can control what we do to it. We can decide to take less and give back more. Whether or not it changes the weather, does it really matter? When we have all taken steps to ensure we all leave Her a little better than we found her. And if we do it thinking that maybe there is a hope of one more generation serviving on this beautiful planet, then what is wrong with that? we the human race are pretty arrogant to think we can harm this PLANET that has been around for 60billions years. Sure we can change that atmostphere, pollute the soil, whatever, but guess what, the planet doesnt care, WE’RE just screwed. When all is said and done, the planet will still be here…the question is just, will we? Mother nature is crying for us, because she TRIED to help us, but we’re the rebellious teen who thinks “she just doesnt understand me” when all she is doing is looking out for us. Wow, what an amazing new theory of seasonal weather patterns — Spring only happens in the mainlands! LOL! Alert The Weather Channel. So how does the warm air know to stay just over the non-glacier-covered parts of the continents without drifting over the glacier-covered parts of the continents? And how do the warm Spring rains know not to fall on the glaciers? Or on icebergs in the middle of the ocean? Oh wait — maybe rain only happens on the mainlands, too. looks more and more like a donkey everytime I look at it. Whether it’s an image of Jesus in a cheese sandwich, the Virgin Mary in a reflective window, or whatever, it seems to me the perceived image says a lot more about the person who ‘names’ the image than it does about the object being named. So this is what Picasso’s work was all about. On that note, I think I will take the long way home. Tears for Earth Fears for Us ? the lips look tooo conicidental but if this is real it’s a fascinating picture that has a very deep meaning. It can be an add to fight global warming…. Great Photoshopped image for CCR = Climate Change Religion. I will do some more. Its great to see how religionists copy these images for proof their belive. we r very mad. u deleted r past coment on this site! bw\ut we satd something like, wow this is so beautiful/meaningful and cool. anyways… cool pic. i for one cant believe all the negative feed back…. 1) its a beautiful picture 2) its fact we are in bad shape when it comes to global warming an ya shouldnt need to see melting ice to prove it.. its all around us ..we need to do something to at least try to stop it, if for no other reason .. think about the future of you childrens children ect.. to me this pic is mother earth crying out for help! Looks like a man who is suffering ! I’m seeing many posts about global warming that include religion and politics. What does global warming have to do with either of these? Can someone explain? It doesn’t matter if global warming is real or not. What IS obviously real is litter seen on the street, the smell of smog in the cities, and the price of an energy bill if a person wastes energy. So stop debating on a theory, and please try to fix what you can sense on your own. I have contacted the artiste Mike Nolan many times by email and nothing he has ever told me makes me feel he took the picture raw and unphotostsopped. In fact, my inner radar tells me it is a fake photo and here’s why: Mike has never posted it on his own personal website because he knows its not really HIS real photo and that he sold it to a UK tabloid newspaper which let him take the money and run in exchange for them having the right to run their own caption on the amazing photoshopped photo. Mike has never really answered my charges against that photo, and now there is new evidence. A new photoshop program can look at a photo and tell if it has been photoshopped. I wrote to Nike the other day, and asked him if he’d allow them to do forensic photoshopping work on his alleged real photo and he hsa not answered me yet. And you khnow what that means? I am a climate activist myself, I am trying to wake people up, and i had wished this photo was real but i am sure it is a fake photo and the entire world has been punked and fooled. Not so much by Mike, he sold the pic too an unethical tabloidy news outlet in the UK and let them do whatever they wnated with his pic, as long as he got the money and ran. He did. He now has a new 2012 photo up on his website of the same glacier face, but guess what, there is not crying woman this time. and no caption. It is a real photo this time. Google him. MIKE NOLAN. can’t blame him, he probably needed the money to fund his other photo work with animals and wildlife which is superb. But this crying woman face photo is fAKE, get over it, everyone! but i am still resting my case on the ability of apps like fourandsix to delve into this and tell us the God’s honest truth. we shall see. illustrate what was going on. bought the photo from him for US$10 k did it as was their right. True, Iceland has more nature than coldness. I saw a cloud once that looked like god laughing. It doesnt really look anything LIKE her. It looks like a pack of ice stuck, and if I was asked to recieve and see it as a face, no, I am seeing a kind of face, but that just looks weird. Some people say it looks like a late Michael Jackson! It looks like Michael Jackson!!!!! Turn photo to a poster! I’ll buy the first one!! No comments so far on the KKK figures / hoodies / smurfs / elven warriors on the shore?